Home App Review Entertainment iOS iOS App What the BLANK?! 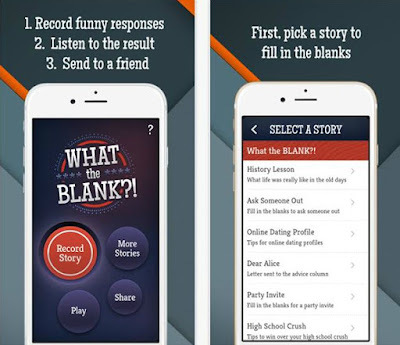 App Review - What the BLANK?! Maybe you’re looking for an app that offers hours of entertainment and fun. If you are, then What the BLANK?! Is the perfect match for you. Recently brought on the iOS platform, it is one of the most authentic apps that provide fun for you and all of your friends. What the BLANK?! allows you to record yourself and to mix it all up. Select a story from the menu (History Lesson, Ask Someone Out, Online Dating Profile, Dear Alice, Party Invite and many more) that fits you the most. Choose the story and fill in the blanks. Then, record yourself giving funny answers to the offered questions without even knowing where they will go. The audio clips can last up to 60 seconds. After you do that, you can play and listen to the humorous result that the app made. Save your funny recordings and share them with your friends via texts, emails, even if they are not users. Let this amusing app mix your words and create hilarious stories. You can also purchase many additional stories for greater fun or enjoy the free ones. Either way, you can download the app from the App Store.